Marsala chicken is a famous Italian dish in which it consists of lightly floured chicken with a sweet and delicious and sliced mushrooms. Marsala wine are not hard to find, it should be found in the Italian wine section. I received a bottle of marsala wine from one of my professor after giving a talk about my research at my old school. You can add some shallots or even some pancetta. It is important to reduce the sauce until it becomes slightly thick. If not, just add a little bit of flour. 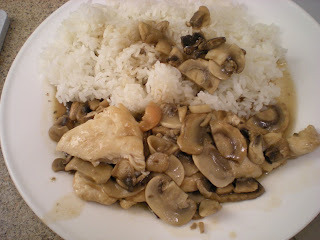 My recipe is very basic, I'm pretty sure there are fancier version of marsala chicken out there. 1. Pound chicken to 1/4 inch thick between 2 sheets of plastic. 2. 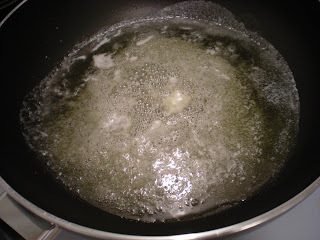 Heat oil and butter over medium-high heat. 3. In a bowl, mix well flour, salt, pepper and basil. 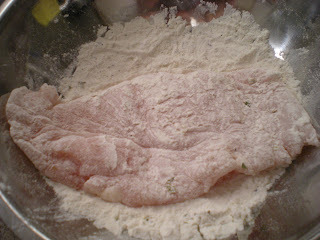 Dredge chicken in seasoned flour mix. 4. Cook chicken until lightly browned on first side about 3 minutes. 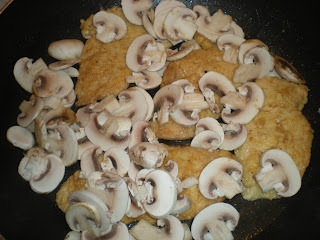 Turn chicken and add mushrooms. Cook about 2 minutes longer. 5. Add wine to pan. Reduce heat to medium-low. Cover and simmer for 10 mins. 6. Serve with cooked pasta, mashed potatoes or rice.